It’s time to look at another title from the legendary 5 dollar bin. Let’s face it, it’s always an honor to pick out a game from that selection and I specifically went to a new Gamestop when I heard that they were still carrying this title. Cruis’n is everything that I had hoped for from the screen shots and while it is a pretty short game, it does have a decent amount of replay value to keep it relevant. There are 13 races and you get to challenge them in Circuit Mode. Landing in the top 3 allows you to move onto the next stage. It is true that you can theoretically complete this game in under an hour since the average race is 2 minutes or less, but but you’re bound to lose at least a few times so beating it in an hour can still be tricky. Keep in mind that you may need to swap cars during this adventure as your first one will likely have some pretty underwhelming specs compared to the first one. Winning a race gives you some spending money, which you can use to buy your next car. I bought most of them and ended up with 3 left. I guess I shouldn’t say “buy” though. When you get enough money, you automatically unlock the car. The final car needs you to have 2 million dollars and I ended the game with a little over one million. You earn 100 grand for each first place so just 10 more races would have been enough to have achieved that. I was tempted to do that so that I could say that I 100% completed the game, but there’s ultimately not a whole lot of point to doing such a thing so I took a pass on that. Perhaps I will go back for that someday. The gameplay is pretty straight forward for a racing game. There are no items or real gimmicks here aside from the casual boost. You can boost three times and it gives you a decent chunk of extra speed, but it’s not too drastic so it doesn’t take the balance away from the game. Since this is an arcade style game you really have a lot of freedom as you drive around. You can break into a building and watch with awe as you look at the fun details. The fact that the developers actually designed the insides of the building is pretty neat since there’s a good chance that you could beat the game without ever going inside. Turning works pretty well and the gameplay is a lot of fun. The game will quickly reset you to the right direction if you’re spun around for too long so you never have to worry about stopping. Just power through to the goal! 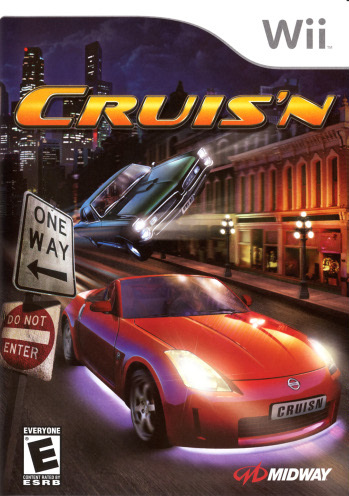 Cruis’n is also purely a motion control game as you hold the Wii remote sideways and tilt to turn. Surprisingly, it actually does a good job with these controls and you’ll never have to adjust the Wii sensor or back away when you realize that the controls are not working. Everything works almost perfectly here and that was definitely neat. Once again, I have to stress that this isn’t your average 5 dollar bin game. One aspect that I liked about the gameplay was the unique addition of random cars on the tracks. A lot of games like Mario Kart have experimented with other cars acting as obstacles, but not to the degree that this game throws them in. Most of the stages have dozens of cars blocking the way in the stages and bumping into one of them can critically hurt your chances of reaching 1st place. They are sometimes driving in the same direction as you or going in the opposite direction so you’ve always got to stay sharp. It’s why using your boost can be a risky endeavor. The graphics are actually very good and that’s where I disagree with most reviews. The general consensus seems to be that the graphics are pretty bad, but everything actually looks pretty sharp. I am quickly reminded of the racing game that I used to play on the computer over a decade ago. The cars and stages are similar to that as well as the gameplay. I loved that game and still consider it to be one of the best racing games of all time. This title may not be quite as good, but it’s still pretty great and that goes for the graphics as well. Most of the game takes place in the night it is impressive to see how clear the game looks. I definitely have no qualms in this area. The area where I do have some qualms with the game is the music. The soundtrack tries to be edgy or ghettoish, which results in some good tunes, but the overall music leaves much to be desired. It’s why I’m not even a fan of the average Madden title as the music gets a little too out there. For racing, I just want fast paced themes with no lyrics. That will let me race to the best of my ability with no distractions. In a game like this, you certainly will need to focus. I also have to take away points for the suggestive content in this game. As this is underground racing, the game has a scantily clad lady holding up the “Ready Set Go” sign and she’ll also dance in the background when you take first place. Throw in the sad voice when you are going through the modes and it takes away some of the wow factor from the game. We definitely didn’t need this and more games should just play it straight if they really want to win. From the voices, the only one that I actually like is the creepy laugh. It pops up randomly during the game and that can definitely be pretty intense. Now, the main reason why this is in the 5 dollar bin is probably because of the lack of content. After you unlock all of the races, then you can unlock a handful of cars. Unlocking those will give you some more options, but there’s nothing to do with them. Playing the stages is the only thing to do aside from the classic Multiplayer mode. You can upgrade each car to its maximum potential by participating in races with all of them, but even the average perfectionalist probably wouldn’t bother with all of that. So the multiplayer mode makes up the majority of the replay value, which means that you will probably want to have someone to play this game with. Otherwise, it’s certainly going to be a very short experience. Overall, Cruis’n is a very fun racing game. Keep in mind that it’s only about 3-4 dollars for a reason, but it’s well worth the price. Given the fact that you could be done with it in 30-60 minutes, I could understand being disappointed if you bought it for 30. Even 20 dollars would have been a stretch, but for under 5 dollars I think this is sufficient. The levels that you do play are pretty great and the A.I. actually manages to keep things competitive. It never gives up and all it takes is one wrong turn to throw you from 1st to 8th. The graphics are better than expected and they easily hold up against any racing game. The suggestive content can make you wince, but it’s still not as bad as it could have been and it disappears once you are actually in the race. I definitely recommend this title and now I’m looking forward to seeing what racing game I play next. Let’s just say that we may not have to wait very long for that. Also, it should be known that I used the Pontiac Firebird during my playthrough since they didn’t have the Quest. It’s a very reliable car and I recommend using it when you play this game. This entry was posted in 7 Star Games, Game Reviews, Games, Reviews and tagged Arcade Port, Cruis'n, Driving, Game Review, Nintendo, Nintendo Wii, Racing, Racing Game, Review, The Fast and the Furious, Video Game Review, Wii Review by dreager1. Bookmark the permalink.